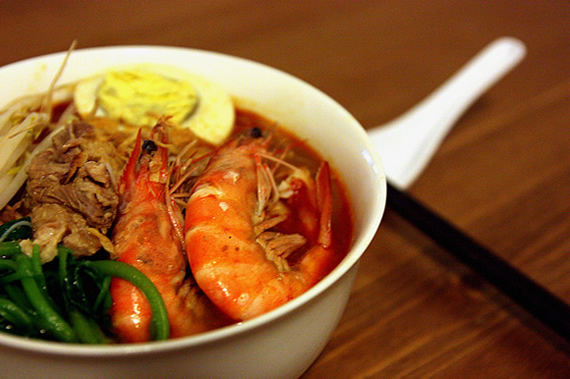 The most time consuming part of cooking Penang Prawn Mee is the broth, it’s an element that will either make or break the dish so take the time to clean the pork bones and use the freshes prawns you can get. You need A LOT of prawns/shrimps for this dish. 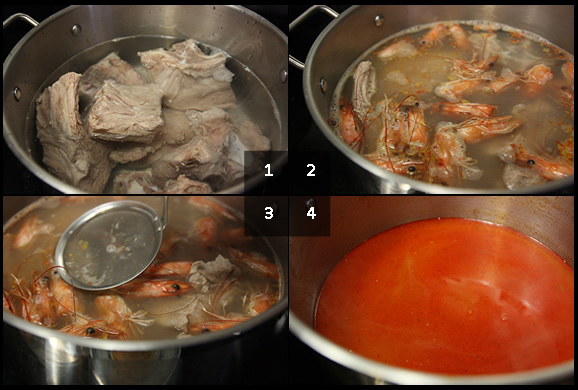 Usually, I would used 1500 grams worth of shrimp shells and 700 grams of pork bones for 1.5 liters of broth. If you cannot get as much shrimp shells, you should get a sachet of Tean’s Gourmet Prawn Noodle Paste from your Asian grocery store for a bit of help in boosting the flavour of your broth. You may use other brands but I won’t be able to guarantee how the flavours will turn out. We are going to blitz all these ingredients in a blender. Or if you feel like pounding, use a mortar and pestle. To start off, you will need 1 large pot, 1 medium large pot, a fry pan and 1 large basin for any rinsing and tempering jobs. 1. We’ll first clean the pork bones by boiling them in water for 10 minutes. You’ll see all the gunk floating on the surface of the water and that’s what we want to get rid off for a cleaner tasting broth. Pour the water off and rinse the pork bones, get rid of any dangling fats and white membranes under the running water. Set them in the large basin, while you clean up the pot well. 3. In the same pot, with the oil, add the black pepper, star anise, cloves and the pork bones in and cover the bones with water. While you’re waiting for the pot to come to a simmer, peel the prawns and reserve the shells and heads. 4. When the pot comes to gentle boil, add all the prawn heads and shells in with the sugar and salt. Reduce the heat to a medium low and let it cook for 1 hour. Important: Skim the orangey red foam off the surface every now and then. While your stock is cooking, it’s time to make your spice paste. 5. In a blender, add all the ingredients in column B, except for the oil, and blitz until fine. Add a tablespoon or two of water to get the paste going if it’s too dry. 6. Once the fresh spice paste is ready, heat up your pan with 1/4 cup of oil and saute the spice paste on medium heat. I sauteed mine for approximately 15 minutes until the paste turns into a dark ruby red and the fragrance of chilies and shrimp permeates the air so thickly you could choke. But all is forgiven when you give it a taste. 7. You will get almost a cup worth of spice paste, set it aside. 10. The stock is now ready for the spice paste to be added in. Take half a portion of the spice paste and stir it in. From there, you will find that the stock graduates into a broth. It transforms into a rich, emulsified, full-bodied life. Spicy oils from the spice paste floats over the top with a nice red sheen, as if it is a protective layer of the deliciousness below. Your broth is now ready. Keep it heated through and piping hot in a low heat. We pretty much got most of the toppings done while the soup was cooking. All that is left are the noodles, Kangkong and bean sprouts. 12. Set the toppings and noodles to get ready for assembly. 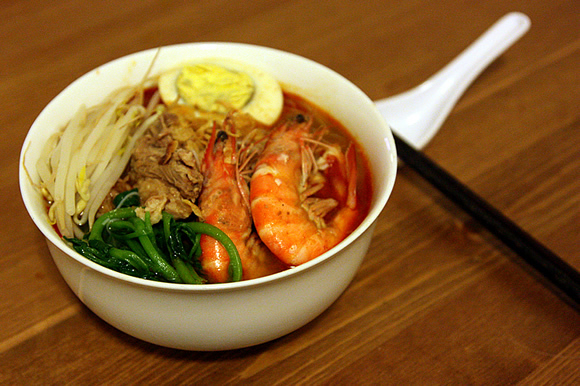 In a bowl, take a bit of rice vermicelli and yellow noodles and add the piping hot broth over them. Add the toppings and an extra spoon of spice paste, if you’d like. Nice work. 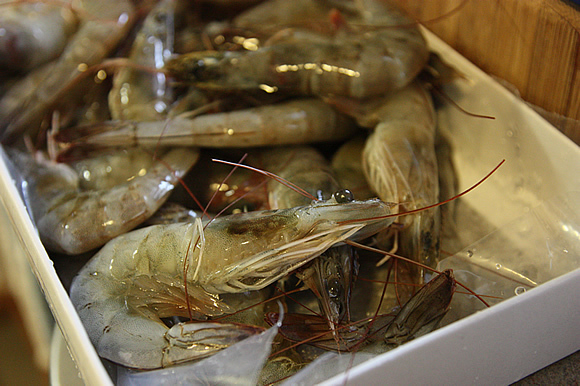 Looks like you got some really nice prawns. leaf: It was worth the 2.5hours of cooking. What a mouthwatering bowl of har mee. Love the photos. Salivating now…could do with a bowl right now too. after reading this post, i’m going to take a cab and travel 30 mins to the nearest Penang restaurant for lunch!